The SWITCHWARE® G4 “Electronic Journal” solution simplifies an ATM network manager’s ability to access ATM activity data crucial to the monitoring, management and optimization of the self-service delivery channel. By managing the ATM’s electronic journal (EJ) history and log remotely, banks save countless hours formerly spent maintaining journal receipts locally at the machine. In the past ATMs typically had two printers for recording transactions, the customer transaction receipt printer and the internal record journal printer used to track daily ATM activity. Financial institutions needed to ensure that journal paper was well-stocked, and collect the journal each time the ATM was balanced. This process, both tedious and time consuming, was a logistical nightmare for banks trying to keep up with fleets of ATMs. Now, with CSFi’s “Electronic Journal” solution, remote access to the ATM journal is a cinch. Designed to streamline the monitoring of the ATM electronic journal in a multi-vendor environment, the SWITCHWARE G4 “Electronic Journal” solution provides a single browser based view of the entire ATM electronic journal estate including NCR, Diebold, and Triton ATMs. 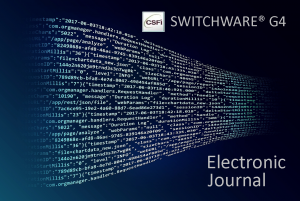 Whether downloading searchable historical data or streaming terminal specific real-time ATM activity, the scalable and secure SWITCHWARE “Electronic Journal” module enables authorized users to efficiently monitor and manage electronic journal functionality for nearly any multi-vendor ATM portfolio.